Today I got to try out, for the first time, a restaurant that opened recently in Joplin. 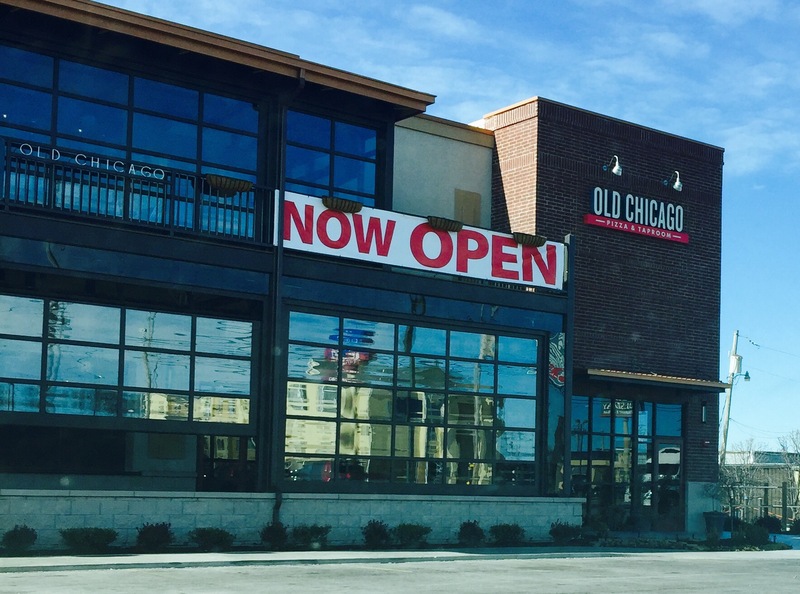 Old Chicago Pizza is located at 3320 S. Range Line Road. I met my good friend Garen there, who is always great to suggest new places to experience. I arrived a few minutes ahead of Garen and looked up info about this restaurant. 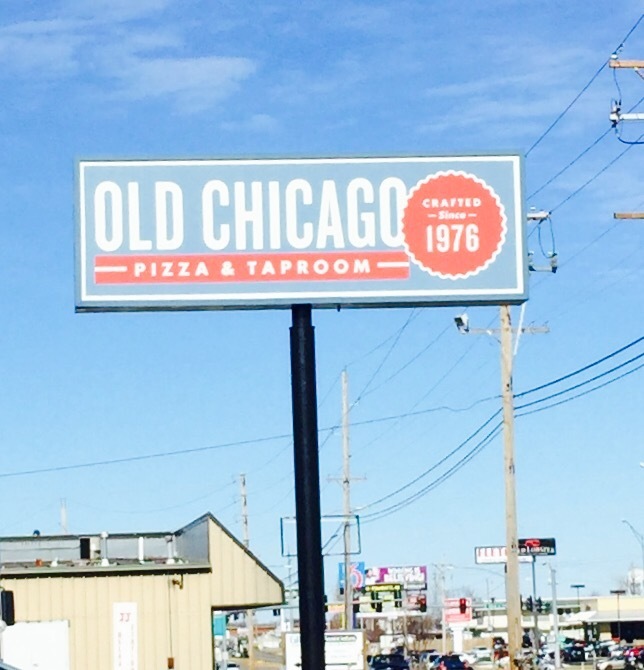 Old Chicago Pizza and Taproom started in 1976 in Boulder, Colorado. It is now part of CraftWorks Restaurants & Breweries, which operates 60 restaurants in 22 states. 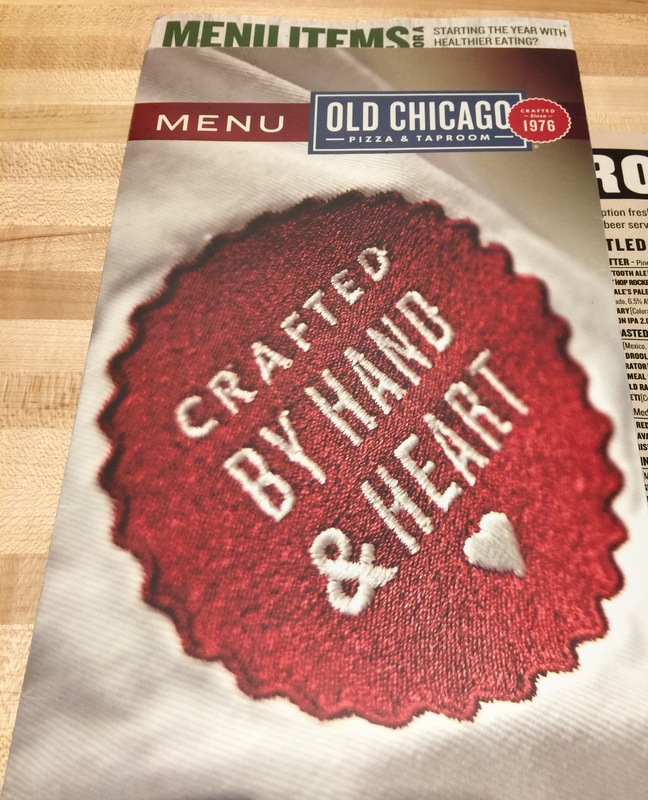 Old Chicago features delectable pizzas in deep dish, thin crust or stuffed crust versions. They also serve more traditional dishes, such as pastas, sandwiches, salads, burgers and calzones as well as appetizers. The cheesecake is highly recommended. And each restaurant carries a wide assortment of beer. The Joplin restaurant is clean and brightly lit, with ample seating space, and a bar at one end. Garen joined me at a booth and the task began of deciding what to order for lunch. Everything in the menu looked appealing. We passed on an appetizer, although they offered great choices. Although we were in a place that specializes in pizza, both of us opted for a sandwich. I’ll try the pizza another time. 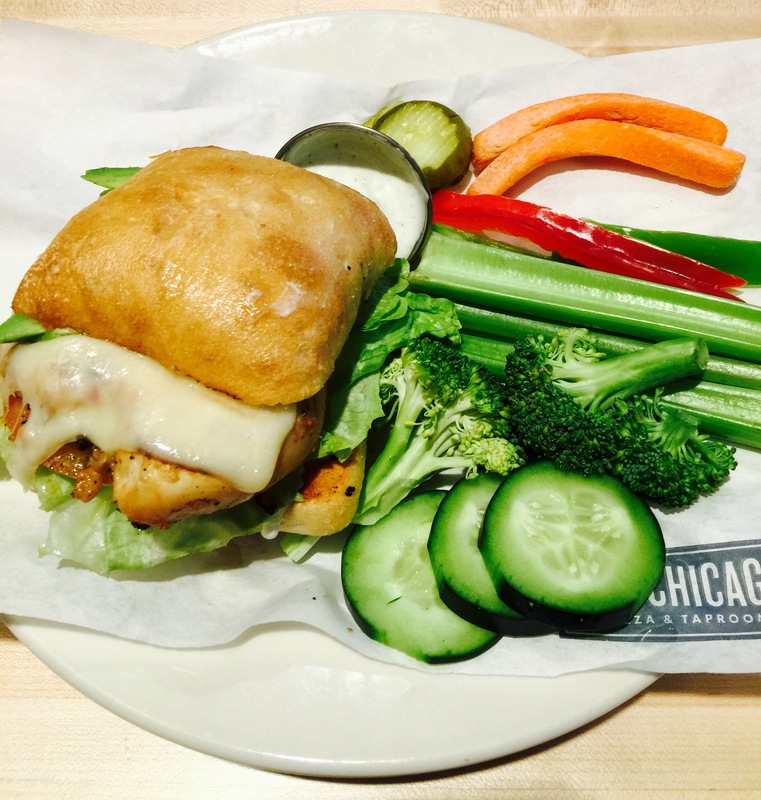 I sampled the California Chicken Sandwich, primarily because it is served with slices of avocado, accompanied by a side of fresh veggies with ranch and bleu cheese dressing for dipping. Garen had a Spicy Thai Chicken Sandwich with the fresh veggies as well. Both sandwiches looked amazing! I can only vouch for mine…it was amazing. I believe Garen enjoyed his also. We quickly gave up trying to pick the sandwiches up to eat them. They were so loaded, it was impossible not to make a mess. A knife and fork worked well. What a great meal, at Old Chicago, and a wonderful time of catching up and sharing with my friend. I deeply value Garen’s perspectives on life and his input. We’ve been friends for seven years and it’s been a privilege to journey with him, learning, growing, discussing ahas and oh nos along the way. He’s been present with me through times of great joy and great sorrow. Today he told the waitress it was my birthday. It was…last month! She wished me happy birthday several times, and even left a note on the bill, writing “Happy 21st birthday! !” 😃 To celebrate the day, we of course had to try Old Chicago’s famous cheesecake. Covered with strawberries and blueberries, we found it worthy of its reputation! Garen’s birthday was last month also, just three days after mine. It’s my turn to treat him to lunch. I’m thinking about what new place to try next!